I began reading this book and couldn't put it down! For a first time writer Sean Stalzer did a super job. I found this boook to be extremely informative with facts of on-line gaming and an entertaining easy to read book. As a gaming person I have often wondered about the concept of a guild and the true role of a member. The visions of one person has become a guild of many. This vision continues to expand and prosper. I found this book to be a very enjoyable read. It shows us gaming history from the very beginning all the way up till present and shows us how one truly successful Guild has managed to not only survive but to thrive. It's a great read and has loads of interesting stories that even the non-gamer would enjoy. Anyone interested in fantasy or gaming would very much enjoy this book. A friend insisted that I read this, someone who's recommendations I take seriously. I was skeptical, naturally. He found a sample chapter and forced it on me. The story got its hooks in me within the first 30 pages, and after that it flowed, it positively galloped. This book really helped me to understand what it really takes to become a guild and the amount of work needing to be put into it. I'm probably a bit older than the average gamer, and am not a high-intensity, heavily-committed player. But reading this book was eye-opening. It richened my appreciation and understanding of the online game world immensely! Anyone who spends any time at all with MMORPG's must read this book to get an inside look at the gaming world and the complexities of the guilds that are so much a part of it. Whether you're an Ancient or a Newb in the gaming world, you'll find this book fascinating. A real perspective on how gaming has developed and how on-line communities within them thrive. This was a very interesting read into the world of MMORPGs. Even though I've been gaming for years, I had no idea what is involved in managing a huge guild. This is a very insightful read. The history and future of online gaming. 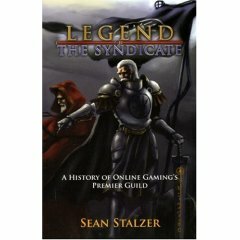 The history and future of Guilds and specificully the history of The Syndicate, a premire guild if ever there was one. Read this book, you won't be sorry.